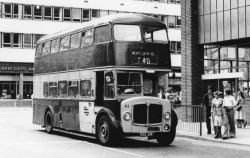 New to Leeds City Transport (as fleet number 952) in 1964, this type was the last in a line of AEC / Roe buses for the City that began in 1932. It has 'modern' features including semi-automatic gearbox and fluorescent interior lighting, and a 9.6 litre AEC engine. Withdrawn in 1975, this bus passed to OK Motor Services, Bishop Auckland, then to Tyne & Wear PTE who were suffering a severe vehicle shortage at the time - the Tyne & Wear 'livery' consisting of painting front panels yellow, as it was intended to be a short term member of the fleet. During its time with Tyne & Wear, it was mainly allocated to Byker depot in Newcastle, and at some point it was re-numbered 1413. Final withdrawal from service came in 1979 when the bus passed into preservation. 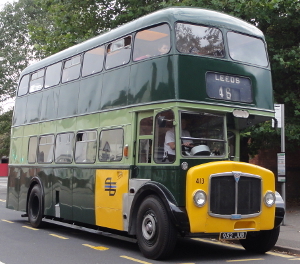 After being rallied for some years in full Leeds livery, it was taken off the road for further restoration, which included construction of a new platform frame, new front wings, some new exterior panels, an overhaul of the electrical system, some new interior panels, and the seat frames being re-painted. A number of mechanical components were also overhauled, and a new set of tyres fitted. It returned to the road in Summer 2014 after many years out of action, in the guise of Tyne & Wear PTE 413, being one of the few examples in preservation of a bus carrying its 'second hand' livery. There are one or two minor items to finish, and it may return to Leeds livery at its next repaint. WANTED - a rear destination blind for this bus. April 2014 - The interior has been given a deep clean after years of inactivity, and several repairs undertaken. New lifeguard rails will soon be fitted. A new set of tyres has also been fitted and the alternator removed for repair. July 2014 - The electrical issues have been resolved, and the bus has received a coat of paint and has passed its first MOT test in many years.